This article is about the company that existed until 2015. For the successor, see Orbital ATK. Orbital Sciences Corporation (commonly referred to as Orbital) was an American company specializing in the design, manufacture and launch of small- and medium- class space and rocket systems for commercial, military and other government customers. In 2014 Orbital merged with Alliant Techsystems to create a new company called Orbital ATK, Inc., which in turn was purchased by Northrop Grumman in 2018. Orbital was headquartered in Dulles, Virginia and publicly traded on the New York Stock Exchange with the ticker symbol ORB. Orbital’s primary products were satellites and launch vehicles, including low-Earth orbit, geosynchronous-Earth orbit and planetary spacecraft for communications, remote sensing, scientific and defense missions; ground- and air-launched rockets that delivered satellites into orbit; missile defense systems that were used as interceptor and target vehicles; and human-rated space systems for Earth-orbit, lunar and other missions. Orbital also provided satellite subsystems and space-related technical services to government agencies and laboratories. On April 29, 2014, Orbital Sciences announced that it would merge with Alliant Techsystems to create a new company called Orbital ATK, Inc. The merger was completed on February 9, 2015 and Orbital Sciences ceased to exist as an independent entity. On September 18, 2017, Northrop Grumman announced plans to purchase Orbital ATK for $7.8 billion in cash plus assumption of $1.4 billion in debt. Orbital ATK shareholders approved the buyout on November 29, 2017. The FTC approved the acquisition with conditions on June 5, 2018, and one day later, Orbital ATK were absorbed and became Northrop Grumman Innovation Systems. Orbital was founded and incorporated in 1982 by three friends who had met earlier while at Harvard Business School—David W. Thompson, Bruce Ferguson and Scott Webster. Initial capitalization for Orbital was provided by Fred C Alcorn, a Texas oilman. In 1985, Orbital procured its first contract for providing up to four Transfer Orbital Stage (TOS) vehicles to NASA. In 1987, the seeds for the ORBCOMM constellation were planted when Orbital began investigating a system using Low Earth orbit satellites to collect data from remote locations. In 1988, Orbital acquired Space Data Corporation in Arizona- one of the world's leading suppliers of suborbital rockets- thereby broadening its rocket business and manufacturing capabilities. This was followed by the opening of a new facility in Chandler, Arizona in 1989 to house the company's expanding rocket business. In 1990, the company successfully carried out eight space missions, highlighted by the initial launch of the Pegasus rocket, the world's first privately developed space launch vehicle. Shortly following the successful Pegasus launch, Orbital conducted an IPO in 1990 and began trading on the NASDAQ stock exchange. In 1993, Orbital established its current headquarters in Dulles, Virginia followed by the acquisition of Fairchild Space and Defense Corporation in 1994. In the same year (1994), Orbital successfully conducted the inaugural launch of the Taurus (now renamed as Minotaur-C) rocket. Orbital's acquisitions continued throughout the 1990s including the acquisition of CTA, Inc in 1997, a company having designed and built the first geostationary "lightsat" under contract to Indonesia for Asia's first Direct Broadcast Satellite (DBS) television broadcast program - providing an entry into the fast-growing Geosynchronous (GEO) communications satellite market. In the early 2000s, Orbital continued expanding its missile defense systems business with a $900 million award to develop, build, test and support interceptor booster vehicles. In 2006 Orbital conducted its 500th mission since the company’s founding with a diverse portfolio of products that included satellites, launch vehicles, and missile defense systems. 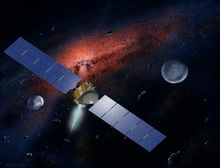 In 2007, the first interplanetary spacecraft built by Orbital, Dawn was launched on an eight-year, three-billion-mile journey to the main asteroid belt between Mars and Jupiter. A major milestone in the company's history was in 2008 when it received a long-term NASA contract to provide cargo transportation services to and from the International Space Station (ISS) with a value of approximately $1.9 billion for missions from 2011 to 2015. Orbital is currently on-track to deliver on this contract with its Cygnus spacecraft and Antares rocket following the success of Cygnus Orb-D1 and Cygnus CRS Orb-1. In 2010, Orbital announced its acquisition of the Gilbert, Arizona-based satellite development and manufacturing unit from General Dynamics to complement its main satellite manufacturing facility in Dulles, Virginia. On April 29, 2014, Orbital Sciences announced that it had entered into a definitive agreement with Alliant Techsystems to combine Orbital and ATK's Aerospace and Defense (A&D) Groups to create a $4.5 billion (combined calendar year 2013 annual revenue), 13000-person company. The new company was called Orbital ATK, Inc.
On September 18, 2017, Northrop Grumman announced plans to purchase Orbital ATK for $7.8 billion in cash plus assumption of $1.4 billion in debt. Orbital ATK shareholders approved the buyout on November 29, 2017. The FTC approved the acquisition with conditions on June 5, 2018, and one day later, Orbital ATK were absorbed and became Northrop Grumman Innovation Systems. Orbital was a provider of small- to medium-class satellites. Since the company's founding in 1982, Orbital has delivered 150 spacecraft to commercial, military and civil customers worldwide. To date, these spacecraft have amassed well over 1000 years of on-orbit operations. The Communications & Imaging Satellites developed by Orbital are smaller and more affordable. The Geosynchronous orbit (GEO) communications satellites provide commercial satellite services such as direct-to-home digital television, business data transmission, cable program distribution and wireless communications. In addition, Orbital also provides constellations of Low Earth orbitcommunications satellites such as the 35-satellite ORBCOMM data communications network, and the 81 spacecrafts (integration and test) for the IridiumNEXT constellation. Earth imagery and high resolution digital imaging satellites such as the OrbView series are also developed and manufactured by Orbital. The Science & Environmental Satellites developed by Orbital perform scientific research, carry out deep space exploration (e.g. Dawn spacecraft, conduct remote sensing missions (e.g. Landsat 4, 5 and 8), and demonstrate new space technologies. In the last 10 years, Orbital has built more scientific and environmental monitoring satellites for NASA than any other company. Orbital's space launch vehicles are considered the industry standard for boosting small payloads to orbit. The Pegasus rocket is launched from the company's L-1011 carrier aircraft, Stargazer and has proven to be the industry's small space launch workhorse, having conducted 40 missions from six different launch sites worldwide since 1990. The Minotaur ground-launched rockets combine Pegasus upper stages with either government-supplied or commercially available first-stage rocket motors to boost larger payloads to orbit. Minotaur IV combines decommissioned Peacekeeper rocket motors with proven Orbital avionics and fairings to provide increased lifting capacity for government-sponsored payloads. With the development of the Antares space launch vehicle, Orbital is extending its capabilities to provide medium-class launch services for U.S. government, commercial and international customers. The inaugural launch of Antares occurred on April 21, 2013 from Wallops Flight Facility at Wallops Island, Virginia. Orbital is also a major provider of suborbital target and interceptor launch vehicles for the U.S. missile defense systems. In the last 10 years, Orbital conducted nearly 50 major launches for the U.S. Missile Defense Agency (MDA), the Air Force, the Army and Navy to develop, test and enhance U.S. missile defense systems. Orbital’s Advanced Programs Group focused on developing and producing human-rated space systems, satellites and related systems for national security space programs, and advanced flight systems for atmospheric and space missions. In support of human space systems, Orbital is one of two companies providing commercial cargo resupply services to the International Space Station for NASA. Orbital's medium-class rocket- Antares is used to launch the Cygnus advanced maneuvering spacecraft to deliver cargo to the ISS. Under the Commercial Resupply Services contract with NASA, Orbital will perform eight cargo missions to the ISS. Operational flights began in 2013 from the new Mid-Atlantic Regional Spaceport at Wallops Island in Virginia. In addition, the company is exploring opportunities to adapt the Cygnus design for other possible space exploration applications. For National Security Space Systems, Orbital provides products ranging from smaller, more affordable spacecraft busses to hosted payload applications. For Advanced Flight Systems, Orbital is applying its to design and build an intermediate-class air-launched rocket system for Stratolaunch Systems. Orbital has developed the operational concept and completed the preliminary design for the air-launched rocket . It will be responsible for the development, production, test and operations of the full system and related ground operations. The Technical Services Division (TSD) provided engineering, production and technical management expertise primarily for space-related science and defense programs. Typically, it supplies specialized personnel — engineers, scientists, technicians and other professionals — with specific knowledge in the areas that its customers are pursuing. The Orbital employees often work side-by-side with the customers' technical staff at their facilities. They perform a wide range of functions, from system-level efforts such as special payload equipment and training support for NASA's Hubble Space Telescope servicing missions to component-level tasks including development of high-energy microwave transmitters for the National Radio Astronomy Observatory. The TMS unit combined satellite navigation and wireless communications to enable transit control centers to manage the dispatch of public transit, highway service vehicles and commuter light rail systems. As of 2008 the technology was used by more than 60 clients, exceeding 27,500 vehicles, or more than 30 percent of the U.S. and Canadian fleet. TMS clients included some of the nation's largest fleet management systems, such as Los Angeles, Chicago, and Washington, D.C. In 2008 technology services provider Affiliated Computer Services Inc. agreed to buy the Transportation Management Systems unit for $42.5 million. The sale transferred an estimated 130 to 140 Orbital employees based in Columbia, Md to ACS. Minotaur - Employing a combination of U.S. government-supplied rocket motors and Orbital's commercial launch technologies, the Minotaur family of launchers provides low-cost access to space for government sponsored payloads. Minotaur I - Minotaur I made its inaugural flight in January 2000, successfully delivering several small military and university satellites into orbit and marking the first-ever use of residual U.S. Government Minuteman boosters in a space launch vehicle. To date, Minotaur I has conducted 11 missions with a 100% success record, having launched a total of 62 satellites. Minotaur IV -The Minotaur IV space launch vehicle consists of three Peacekeeper solid rocket stages, a commercial Orion 38 fourth-stage motor and subsystems derived from OSC's established space launch boosters, including a flight-proven standard 92-inch fairing. Capable of boosting payloads more than 1,750 kg into orbit, Minotaur IV supports dedicated or shared launch missions and is compatible with multiple U.S. government and commercial launch sites. The inaugural Minotaur IV flight occurred in 2010 and five missions have been conducted through 2016 with a 100% success record boosting nine satellite into orbit and two hypersonic flight vehicles on suborbital trajectories. Minotaur V - Minotaur V is a five-stage evolutionary version of Minotaur IV to provide a cost effective capability to launch U.S. Government-sponsored small spacecraft into high energy trajectories, including Geosynchronous Transfer Orbits (GTO) as well as translunar and beyond. Like Minotaur IV, the first three stages of the Minotaur V are former Peacekeeper solid rocket motors. The fourth and fifth stages are commercial STAR™ motors. The inaugural Minotaur V mission successfully boosted NASA's LADEE spacecraft on a lunar trajectory in September 2013. Minotaur VI - The Minotaur VI vehicle adds a lower stage to the existing and flight demonstrated Minotaur IV vehicle configuration providing a significant increase in performance with only a modest increase in cost. Capable of boosting up to 2,600 kg to Low-Earth Orbit, Minotaur VI is also available with an optional upper-stage motor for high energy trajectory missions. Minotaur-C - The Minotaur-C (formerly known as Taurus) space launch vehicle is a commercial variant of the Minotaur product line designed to serve the U.S. government market. Of 9 launches, 6 have been successful. Pegasus - The three-stage Pegasus is used to deploy small satellites weighing up to 1,000 pounds into low-Earth orbit. Pegasus is carried aloft by the "Stargazer" L-1011 aircraft to approximately 40,000 feet over open ocean, where it is released and free-falls five seconds before igniting its first-stage rocket motor. With its unique delta-shaped wing, Pegasus typically delivers satellites into orbit in a little over 10 minutes. Pegasus has conducted 42 missions since its inaugural launch in 1990, 37 of which were successful. Pegasus II - Pegasus II was to be an air-launched orbital rocket, which was under development in 2012–2015. The design was "shelved" by Stratolaunch in May 2015. Antares - Antares is a two-stage launch vehicle designed to deliver medium-class payloads weighing up to 6120 kg into space. Antares utilizes refurbished Russian-built engines which were originally manufactured in the 1960s and 1970s for the Soviet moon rocket. Initially developed to demonstrate commercial re-supply of the International Space Station under a NASA contract, the first launch took place on April 21, 2013, from Wallops Flight Facility, Virginia. The fifth launch ended in failure on October 28, 2014, completely destroying the vehicle and damaging the launch pad. Antares follow on - Following the loss of the Antares rocket on the Orb-3 mission in October 2014, Orbital announced that it would not use "the 40-year-old AJ-26 engines on the rocket’s next flight." The new first stage engine is reportedly the Russian RD-193 rather than the AJ-26 engines used in the initial version of the Antares launch vehicle, which were remanufactured Russian NK-33s. Orbital Sciences Corp. has reportedly signed a contract with Russia’s NPO Energomash to supply 60 new built RD-181 engines for the Antares rocket. While Antares/AJ-26 is not flying and the follow-on launch vehicle is in development and test, Orbital is shopping to purchase launch services for its Cygnus capsule to ISS cargo runs temporarily from another launch service provider. With the successful demonstration in September 2013 of the Cygnus spacecraft and the Antares launch vehicle under the Commercial Orbital Transportation Services (COTS) program, Orbital commenced regular ISS cargo missions under the Commercial Resupply Services (CRS) contract. The total NASA contract to Orbital is worth $1.9 Billion for providing eight pressurized cargo missions to the ISS. Cygnus is capable of delivering 2,000 kg of pressurized cargo to the ISS. An enhanced version to be flown in later CRS missions is able to deliver 2,700 kg of pressurized cargo. The first of the eight contracted Cygnus missions to the ISS was completed on 18 February 2014. The October 28, 2014, launch failure was the third contracted Cygnus mission to the ISS. Orbital's Missile Defense Systems product line consists of interceptors and target vehicles. The Ground-Based Interceptor - Orbital is the sole supplier of interceptor boosters for the U.S. Missile Defense Agency's Ground-Based Midcourse Defense (GMD) system, to defend against long-range ballistic missile attacks. The GMD system is designed to intercept and destroy hostile ballistic missiles in their midcourse phase of flight before they reenter the Earth's atmosphere. Orbital is responsible for the design, development and testing of the Orbital Boost Vehicle (OBV), a silo-launched, three-stage rocket derived from its Pegasus, Taurus and Minotaur space launch boosters. The OBV has successfully conducted multiple test flights and has been deployed in silos in Alaska and California. Ballistic Missile Targets- Orbital's family of target vehicles extends from long-range ballistic target launch vehicles, which include targets for testing MDA’s GMD system, to medium- and short-range target vehicles. Current programs include Air-launched Intermediate-Range Ballistic Missile (IRBM) targets and Ground-launched Intercontinental Ballistic Missile(ICBM) targets. GQM-163A “Coyote” Anti-Ship Cruise Missile Target - The GQM-163A “Coyote” is used for Anti-Ship Cruise Missile (ASCM) targets. It can achieve cruise speeds of over Mach 2.5 while flying approximately 15 feet above the ocean's surface ("sea-skimming" trajectory). In addition to this sea-skimming trajectory, Orbital has also successfully demonstrated a "high diver" trajectory mission. With its proprietary GEOStar-2 satellite platform, Orbital has become a leading supplier of 1.5 - 5.5 kilowatt Geosynchronous-Earth Orbit (GEO) communications satellites used to provide direct-to-home TV broadcasting, cable program distribution, business data network capacity, regional mobile communications and similar services. With its new GEOStar-3 satellite platform, Orbital is extending its capabilities with up to 8 kW of total satellite payload power. The list of Orbital built GeoStar satellites are provided next. Orbital is also a provider of low-Earth orbit (LEO) communications satellites, having conceived, built and deployed the ORBCOMM network. ORBCOMM was the first global communications network to employ a constellation of LEO satellites. From 1994 -1999, Orbital built and deployed 35 satellites, and integrated five “gateway” ground stations and a network operations center to manage the satellites and process their data. Under a contract with Thales Alenia Space, Orbital is conducting integration and test services for Iridium NEXT, the next-generation satellite constellation of Iridium Communications Inc. Orbital will integrate the communications payloads and platforms for 81 low-Earth orbit Iridium NEXT satellites and test the systems at its satellite manufacturing facility in Gilbert, Arizona. Orbital Imaging spacecrafts are designed to provide commercial Earth imaging services. The OrbView series of spacecraft paved the way for today’s space-based Earth imaging industry. In addition to the OrbView satellites the company also built the GeoEye-1 high resolution imaging satellite. Orbital LEOStar-2 and -3 spacecraft platforms are designed to support a variety of multispectral, visible and thermal imaging payloads. A list of commercial imaging satellites built by Orbital is provided next. Orbital built Science and Environmental satellites conduct astrophysics, Remote sensing/Earth Observation, heliophysics, planetary exploration and technology demonstration missions. These satellites are built on Orbital's LEOStar-1,-2, or -3 satellite platforms depending on the mission requirements and budget. Orbital's national security systems range from smaller, more affordable spacecraft buses (e.g. disaggregated systems) to hosted payload applications. Orbital advocates disaggregated systems because conceptually disaggregated systems can lower the cost and accelerate the development and deployment of national security space systems. For example, Orbital's GEOStar-1 spacecraft provides a compact platform optimized for GEO missions (adaptable for MEO for launch aboard Minotaur, Falcon, and EELV launch vehicles to deliver resilient capabilities in a relatively short period of time (years instead of decades). Orbital's hosted payload capabilities in national security systems include the Hosted Infrared Payload (CHIRP) program for the U.S. Air Force. The wide-field of view sensor was hosted on an Orbital-built commercial GEO communications satellite. Orbital’s hosted payload program takes advantage of the high frequency of commercial satellite launches and the excess resources that typically exist on a commercial communications satellite to provide frequent and low-cost access to space for National Security Systems. Orbital's current advanced flight systems programs include the contract with Stratolaunch Systems to design a new intermediate-class rocket to be carried aloft and launched from the largest aircraft ever built-Stratolaunch carrier aircraft. Orbital is responsible for the program's overall systems engineering, and the development, production, test, and operations of the air-launch rocket and related ground operations, including payload and launch vehicle integration. A demo launch is currently scheduled for 2017. Orbital's heritage programs in advanced flight systems include the NASA X-34 and X-43 programs, and the Orion Launch Abort System, among others. ^ a b c d e f "A Service From Broadridge". Retrieved 12 June 2015. ^ "About Orbital Sciences Corporation". June 2014. ^ a b "Orbital-ATK merger News Release". Orbital. June 2014. ^ "Orbital ATK Press Release". 2015-02-10. Archived from the original on 2015-02-12. Retrieved 2015-02-10. ^ "Orbital Milestones 1982-1989". Orbital.com. June 2014. ^ "Orbital Milestones 1990-1999". Orbital.com. June 2014. ^ "Orbital Milestones 2000–2009". Orbital. June 2014. ^ "Orbital Milestones 2010-present". Orbital. June 2014. Archived from the original on 2014-06-30. ^ a b "Satellites & Space Systems". Orbital. June 2014. ^ a b c d "Orbital Launch Vehicles". Orbital. June 2014. ^ a b c "Advanced Space Systems". Orbital. June 2014. ^ "Space Technical Services". Orbital. June 2014. ^ "ACS to buy Orbital Sciences' transportation management unit". Dallas Business Journal. Apr 17, 2008. ^ "Orbital Locations". Orbital. June 2014. Archived from the original on 2014-06-06. ^ "Best Street Name Ever? Virginia's Warp Drive". Atlas Obscura. Retrieved 7 March 2016. ^ "Minotaur". Orbital.com. June 2014. Archived from the original on 2014-06-06. ^ Dan Roberts. "Antares rocket on ISS resupply mission explodes seconds after launch". the Guardian. Retrieved 12 June 2015. ^ "Live Coverage: Antares explodes moments after launch". Retrieved 12 June 2015. ^ a b "Orbital's Cygnus – on a SpaceX Falcon 9?". spaceflightinsider.com. 2014-11-24. Retrieved 2014-12-01. Orbital has announced that it is planning to use another engine on Antares and that it will likely not use any more of the 40-year-old AJ-26 engines on the rocket’s next flight – which Orbital hopes to conduct in 2016. ^ "Orbital Sciences likely to choose Russian engine for new Antares rocket". TASS. 2014-10-31. Retrieved 2014-12-01. ^ "Antares rocket will get new Russian RD-181 engines in $1bn deal". Retrieved 12 June 2015. ^ "SpaceX and Orbital Win Huge CRS Contract from NASA". NASA SpaceFlight. June 2014. ^ "Missile Defense Systems". Orbital. June 2014. Archived from the original on 2014-06-06. ^ "ASCM Targets". Orbital. June 2014. Archived from the original on 2014-06-06. ^ a b "Orbital Communications Satellites". Orbital. June 2014. Archived from the original on 2014-06-06. ^ "Orbital Imaging Satellites". Orbital. June 2014. Archived from the original on 2014-06-06. ^ "Orbital Science and Imaging Satellites". Orbital. June 2014. Archived from the original on 2014-06-25. ^ a b c "National Security Systems". Orbital. June 2014. Archived from the original on 2014-06-13. ^ "Advanced Flight Systems". Orbital. June 2014. Archived from the original on 2014-06-14.